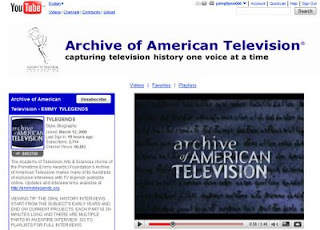 The Academy of TV Arts & Sciences has an interesting You Tube channel going: TVLEGENDS (it's at http://www.youtube.com/user/TVLEGENDS ... their blog is at http://www.emmytvlegends.blogspot.com/ ). About a thousand hours of interviews with a mostly first and second generation TV crowd: there is a ton of stuff to plow through, with more to come I'm sure. Here's a little piece I did to play with the monopod...Jack gave it a try too. I'm also playing around with the new 3-D transitions in Vegas Studio 9. Very nice selection...5 years ago they would have cost 3-5 grand, now they're a bonus feature! Sledding from John Flynn on Vimeo.